What is the Difference Between Mass Tort and Class Action? When a number of individuals (claimants) suffer physical or financial harm resulting from the action of a single entity (or, sometimes, multiple entities), the law provides a few different mechanisms to consolidate the claims in court. 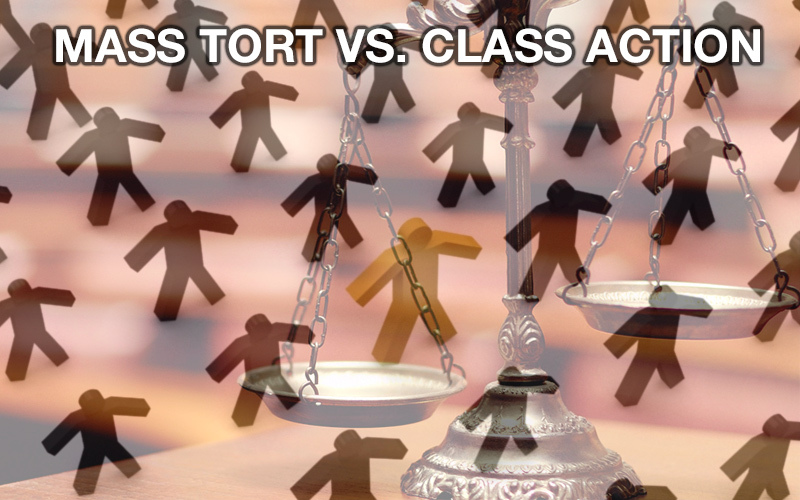 Most claimants are familiar with the term “class action,” but fewer know what a “mass tort” is and how the two mechanisms differ. Before discussing the differences between the two, it is important to understand what a “tort” is. A tort is a civil wrong which causes either physical or financial harm to another, leaving the wrongdoer (known as the “tortfeasor”) legally liable. The injured party is able to take the tortfeasor to civil court in order to be compensated for their loss. When a tortfeasor has wronged several individuals stemming from the same incident or set of circumstances, it makes sense to combine these cases into one legal action to prevent numerous trials being held in different courts. The two most common methods for doing this are through either a class action or a mass tort claim. If any one of these criteria are not sufficiently met, the judge can reject the class designation, and the suit would not move forward as a class action. Due to the hurdles involved in having a group of injured parties certified as a “class,” this route is not always the best option in bringing claims against a tortfeasor. For example, a class action would work well in situations where the injuries suffered by claimants are fairly consistent, such as a company overbilling customers or employees who have been discriminated against based on race, age, or gender. When injuries are less consistent from one claimant to another, a class action may not be appropriate. For example, if a tortfeasor’s negligence caused bodily harm to a large group of individuals, the severity of injuries suffered by one claimant could drastically vary from those sustained by another. In these cases, a class action would not be appropriate, since no matter who the class representative was, they would not accurately represent the entire class. Instead, claimants would be better suited to bring action under a “mass tort.” Similar to a class action, a mass tort involves harm suffered by a large number of individuals stemming from the action or negligence of one or a few individuals. Unlike a class action, the claimants in a mass tort suit are evaluated individually rather than as a whole. In mass torts, instead of a single claim being filed on behalf of all injured parties, each claimant has a separate claim filed on their behalf. This allows for all claims associated with the common cause to be consolidated in one jurisdiction but allows the facts of each case to stand on their own, showing each case is slightly different and the injuries sustained by the claimants are not equal. The two most frequent areas mass torts are used are product liability cases and pharmaceutical cases. When a mass tort is brought in product liability, typically a large number of individuals have been injured by a dangerous product sold to consumers. Similarly, pharmaceutical companies sometimes manufacture prescription drugs which cause serious harm to a number of individuals who consumed the drug. In both situations, mass torts would be the proper venue to bring claims, as the injuries sustained by claimants could be drastically different. While all claims arise from the same tortfeasor and share the same underlying cause, mass torts provide the proper channel to allow each claimant’s case to be evaluated on its own facts, ultimately allowing for compensation to be awarded solely on the basis of what each individual claimant suffered, rather than the group as a whole. Previous Post Previous Post Is water damage covered in your policy?